I was invited as media to this event and received complimentary tickets from Classic Harbor line. No other compensation was received. Any personal views expressed are 100% my own. This past Sunday was a great day to get out and do something kind of day. The weather had cooled down a bit compared to the previous three sweltering days and there was a nice breeze in the air. My husband said, “This is a perfect day for sailing. Too bad we don’t have a boat.” We both laughed together after his comment but I had a little surprise up my sleeve, which made me laugh even harder. 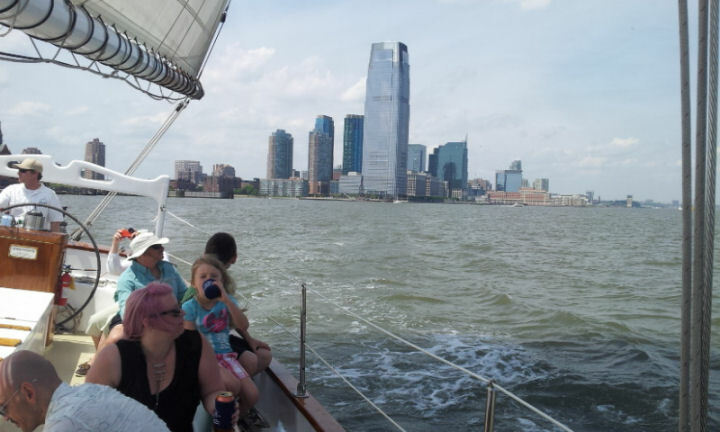 Little did my family know but I had tickets for a sailboat ride around lower Manhattan. After checking on the weather and confirming our reservations I told them all that we were going sailing. They all looked at me like I had two heads and starting saying, “ come on, stop teasing us”. I assured them I wasn’t teasing them and proceeded to show them the website for ClassicHarbor Line. Even after this they still didn’t believe me. It wasn’t until I started packing a bag with snacks, water and sunscreen when they really believe me. 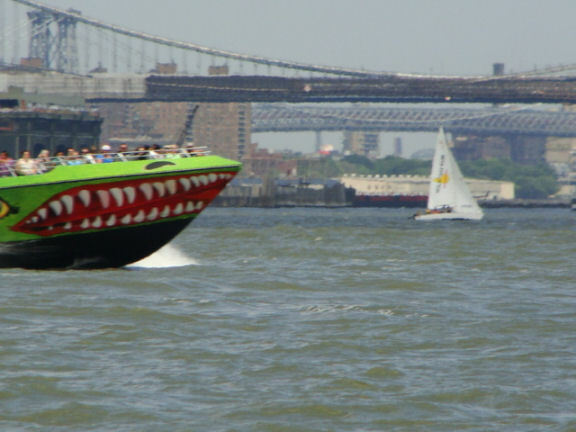 The cruise was scheduled to leave at 1:00 pm from Manhattans Chelsea Piers. We all packed into the car around 11:45 since the cruise company said we should check in between 12:30 and 12:45pm. 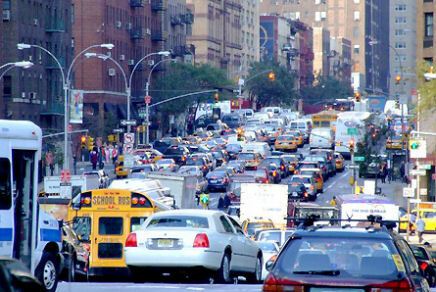 On the way to the West side of Manhattan we hit a bunch of traffic caused by some street closures. I think there was a parade or a street occurring, which is the norm for Manhattan during the spring, summer, and fall months. My husband was getting all worried that we wouldn’t make it on time. 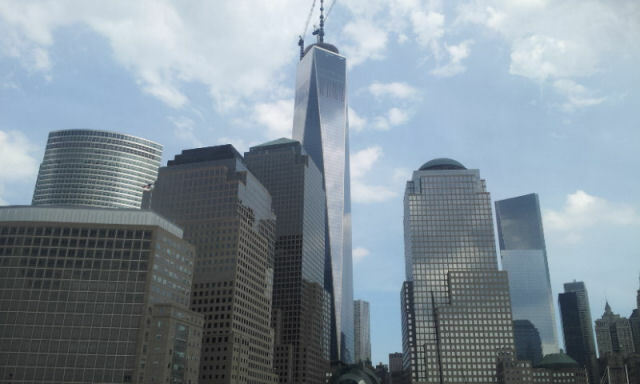 We were only like three blocks away when he said, “I would rather miss the boat by a long shot then to just miss it”. We eventually found a parking spot on the street. Free parking in Manhattan on Sundays in most places so we got lucky. We then did a combination of walking and running towards the piers. We arrived at the booth for Classic Harbor Line around 1250 pm. The attendant gave us our tickets and said they would be boarding the boat in about 5 minutes. Whew! We made it with five minutes to spare. After we all took a few moments to apply some sunscreen. The Captain of the boat came over to the group of us with some news. He apologized in advance, which is never a good sign. He then went on to tell us that they were waiting for the crew from another boat to come in before we could leave on our trip. He added that there would be a 20-minute delay in departure. My husband and I both looked at each other and smiled. We were both thinking the same thing: “Murphy’s Law”. All that rushing and anxiety for nothing. Well at least that delay gave us some time to get some sandwiches for the boat cruise and use the bathrooms one more time. At around 1:30 pm the Captain gave us permission to board the ship. 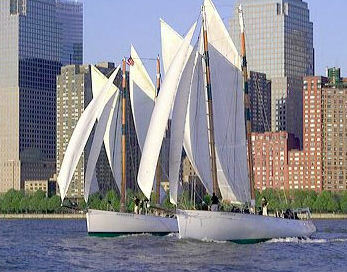 The ship was a beautiful 80-foot schooner named the Adirondack. After the crew helped all of the 12-15 passengers aboard and the Captain went over some safety rules and regulations we were ready to push off. While backing out of the port and for the first 10 minutes or so the Adirondack cruised on engine power. After that however the crew unraveled the sails and we were moving solely on wind power. 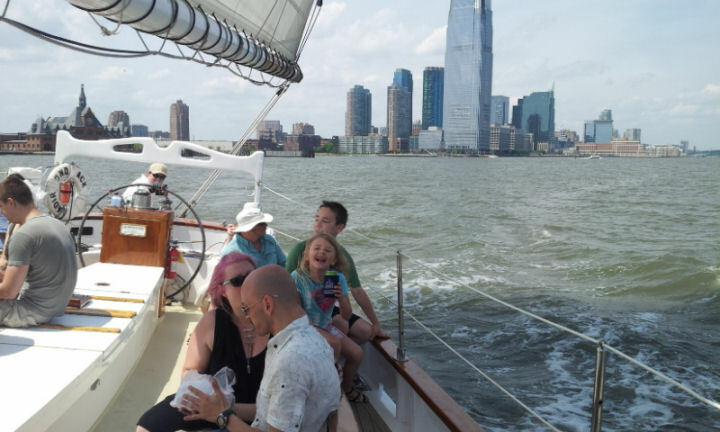 It was so beautiful to see the sails unfurl and fill with air as we cruised down the Hudson River. 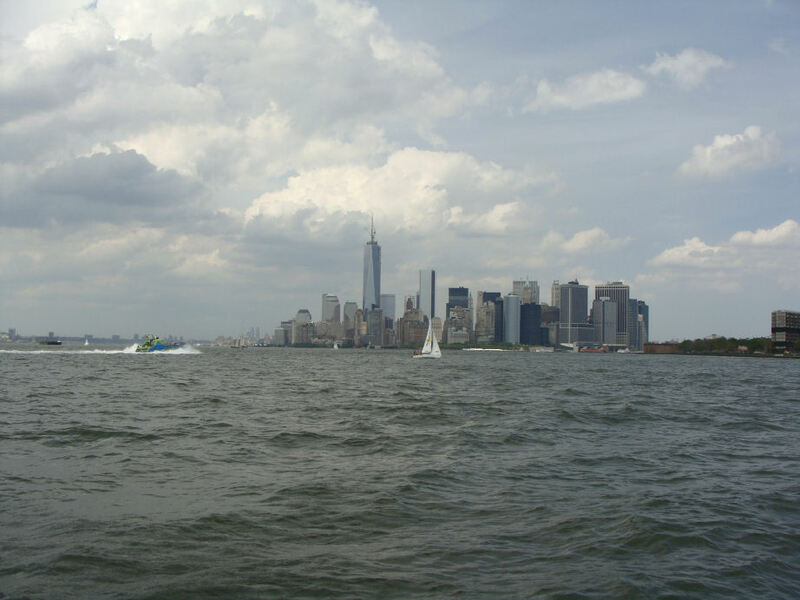 The views of lower Manhattan, the Statue of Liberty and the numerous other sail and motorboats were amazing. 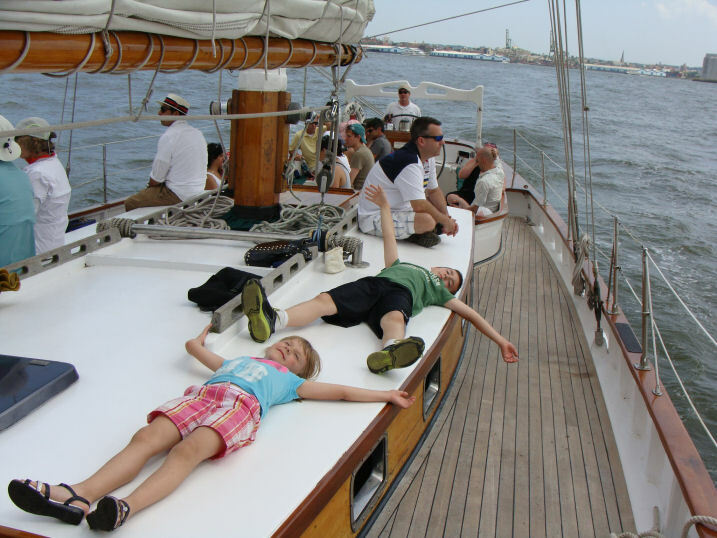 There was a great breeze present, which served to keep us cool and to propel the schooner forward at a nice speed. The crew informed us that there would be several drink services throughout the cruise but no food service. So I guess it was good that we grabbed some snacks ahead of time. 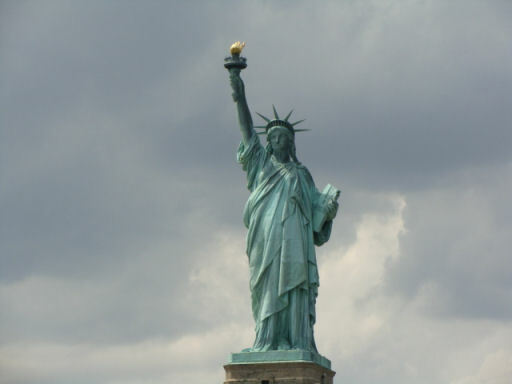 As we were cruising towards the Statue of Liberty we enjoyed some drinks and some tasty sandwiches. The crew members were only two in addition to the Captain. They were very helpful and quite the conversationalists. They were happy to answer questions and had some nice stories to tell as well. 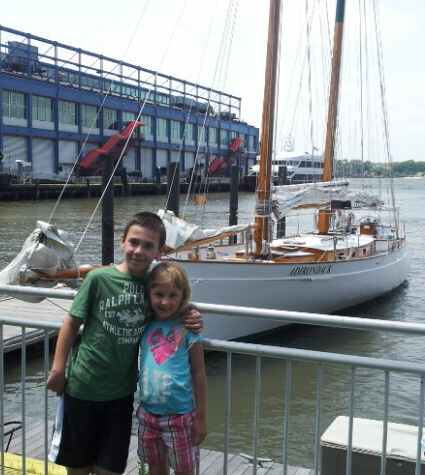 Since it was daytime there were other children aboard the Schooner as well. From looking around I could tell that everyone on the ship was having a great time. 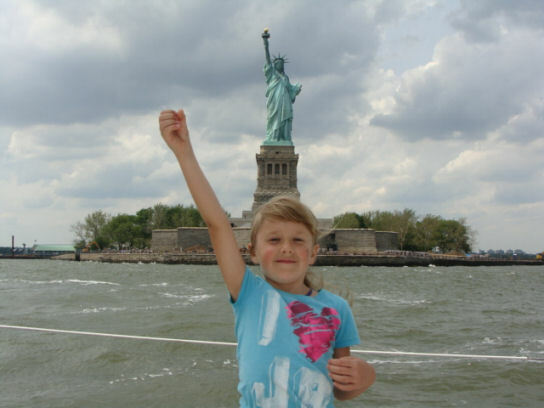 After sometime the Captain sailed us past Governors Island and closer to the Statue of Liberty. 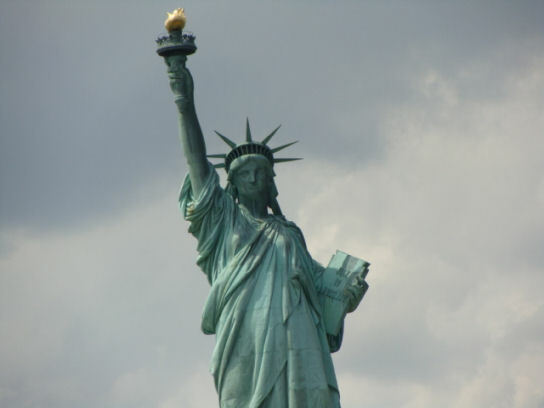 It was really breathtaking to get that close to the island and look up and see our Lady of Liberty staring down upon us. 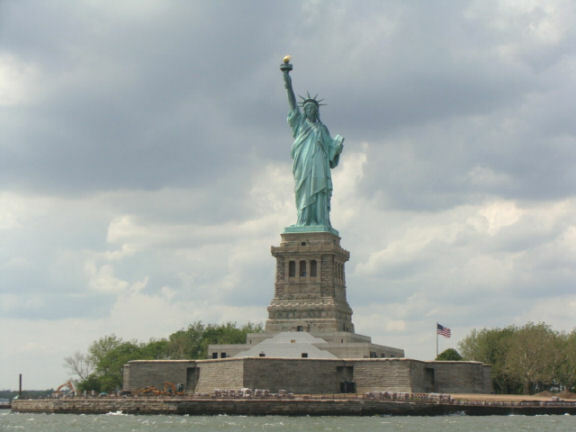 After floating there for a little bit the Captain then pointed the boat in the direction of the Brooklyn Bridge. 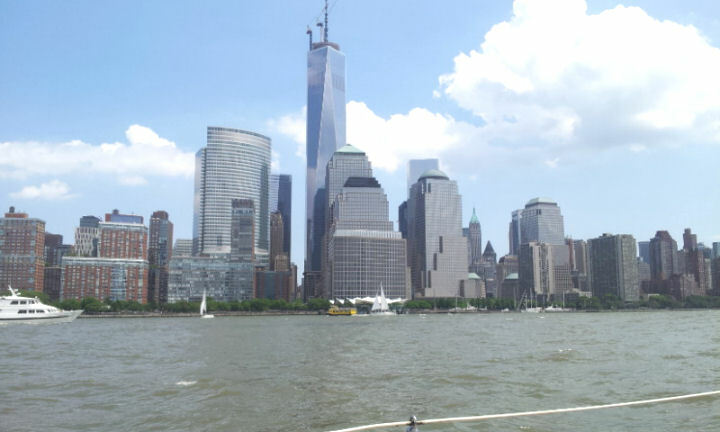 We sailed around Governors Island and then towards BatteryPark. 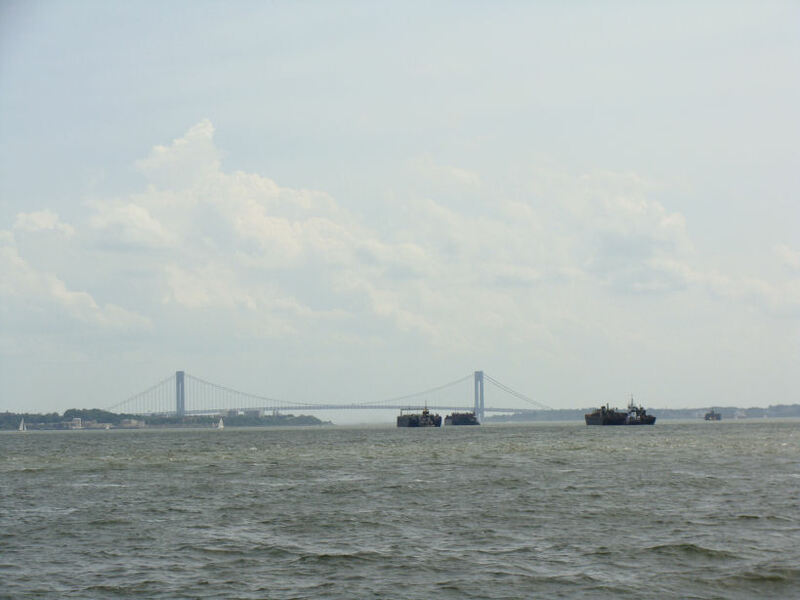 During this time we had an excellent viewpoint of the Verrazano and Brooklyn Bridges as well as downtown Brooklyn and Manhattan. It was great seeing all of these sites as our sailboat leaned into the water with the sails being pushed strongly by the wind. I looked over at one point and saw my husband sitting meditation style on the roof of the cabin. The sails were behind him and he was just gazing out over the water with a very serene look on his face. I think sailing puts you in a great frame of mind. Looking down at my watch it was hard to believe that almost two hours had gone by since we set off. We were all having so much fun that we didn’t even notice how long we’ve been out. The Captain then started heading back to port and the crew began taking down and folding the sails. The rest of the journey would be by the power of engine. As we approached the docks looking around I could tell that everyone aboard the Adirondack had a very memorable day. For me I surely am looking forward to the next time I get to go sailing with Classic Harbor Line.